These kids have some funky fresh moves. Left to right: Skate Lad, Captain Crandall and Rope Girl. Teamo Supremo (2002-2004) was a Disney cartoon originally aired as part of Disney's One Saturday Morning right before its transition into ABC Kids, and was just as quickly shown in reruns on Toon Disney (and for a short while, the regular Disney Channel) when the channel was still showing Disney cartoons on a regular basis. 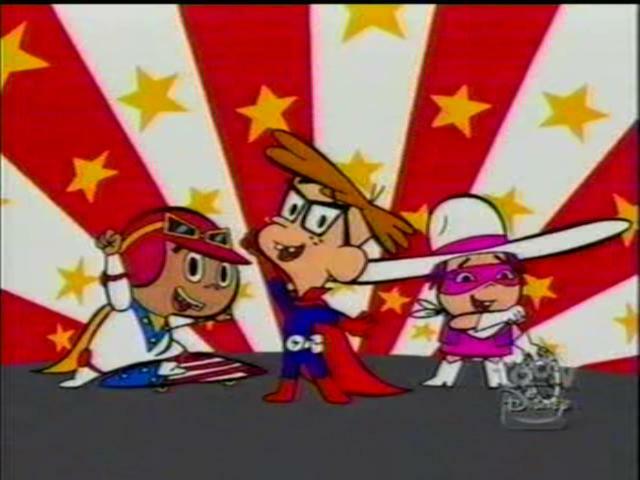 It is a rather simple show about three ordinary schoolchildren named Crandall, Hector and Brenda (right), who take on the secret identities of the eponymous crime-fighting trio to battle evildoers. As superheroes, they call themselves Captain Crandall, Skate Lad, and Rope Girl, respectively. Perhaps because of the simplicity of that, the show was never one of Disney's popular franchises mostly due to coming at a time during The Powerpuff Girls popularity (some detractors even claiming it copied from it though the show had plenty of differences outside the three kid superheroes format) and only had 39 episodes (albeit each one following a Two Shorts format). What the viewers missed out on, though, was a short Story Arc in the third season regarding Crandall's superpowers (he thinks he is an alien) that was left unresolved as a result of the series' cancellation. Action Dress Rip: Tiffany Javelin's manager exploits this by tearing up Tiffany's favorite clothes while she's wearing them to make her look cooler. Actually Pretty Funny: The Aesop of the Stylist episode. After Crandall's mom talks about how styles change, providing a photo of when she was young, Teamo is able to look at their bad haircuts and laugh at them. This gives them the strength to face the Sylist and her taunts for giving everyone a Traumatic Haircut. Adam Westing: Gary Owens, best known for playing various Hanna-Barbera heroes, voiced the Old Superhero Dark Talon (Crandall's paternal grandpa). The governor reacts this way when the only hero auditionees are three elementary school kids. He obviously doesn't want the liability until he sees they are a Badass Adorable team. Crandall in one episode realizes that his mother has been replaced by a robot. He immediately realizes his sister Jean is in danger and goes to warn her . . . only to find she's a robot as well. Bavarian Fire Drill: The Birthday Bandit in his first episode appears as a clown at a party. He then ties up the birthday boy and his parents on the pretext of doing a trick, and has his minions steal the presents. Beach Episode: "Sun, Surf, Sand...and Skull?" Crandall when the Out of This World Cafe and Museum of the Unknown gets destroyed in "Science Friction!" Do not destroy any sector if Paulson is in the vicinity. Compared to that, he doesn't show any anger when Skate Lad confesses to breaking his specialized board. Skate Lad will burst out in ranting Spanish if you belittle Mexican culture. Biting-the-Hand Humor: Tiffany Javelins, an Expy of Britney Spears, who is ordered by her manager to act as a bad girl and have thousands of her fans follow in her footsteps, to sell records. The writers seemed to dive into low blows, given that Britney as an adult struggled with many problems. Most of Tiffany's fans when Paulson creates an Engineered Public Confession that reveals Tiffany is just letting her manager boss her around and tell her what to think. Crandall thinks much less of Dr. Droid after the latter replaces everyone in the city with robot duplicates, including his mother and sister. By the Power of Grayskull! : Crandall's "Rope me, Brenda!" since the kids turn into their superhero forms by jumping together with Brenda's jump rope. At the beginning of the series Paulson updated the kids' weapons from simple toys so that they could handle tougher villains like Technor. When his janitor goes on a mad spree with gloves that affect objects with metal, Paulson downgrades the weapons into wood, plastic and rope so that they can defeat The Gauntlet. Tiffany Javelins in her first appearance made Brenda forget her hero duties. In her next appearance, where Dr. Droid and the manager have replaced her with a robot, Brenda again gets lured towards stardom. Canada, Eh? : One episode features crooked hockey players causing chaos at the World's Fair, attempting to hijack a bus to Saskatoon. Another episode features clothing store robberies being committed by a French Canadian robber named the Trapster. Cartesian Karma: Despite being under her manager's influence and contractual thumb, Tiffany in her first appearance gets arrested for the crimes she committed. By her second episode, she's wised up to not get involved in any more criminal behavior, leading to her manager locking her up. Rope Girl's "Neither did I, but I guess I do!" whenever she displays a new skill and someone else says "I didn't know you could do that". Governor Kevin answers the phone with "Y'ello, you got your guv." Whenever the Chief arrests the villain of the episode and tells them what's going to happen to them, he always ends with "...IN JAIL!!" Jean's "I have to know this stuff if I'm going to be a [insert occupation here] someday." Mrs. Woolingantz excuses the trio from class with "Crandall, Brenda, and Hector, the governor needs you in his office; you are excused." Helius Inflato's very distinctive Evil Laugh, "Har-de-har har har!" Captain Superhero: Crandall's superhero name is Captain... Crandall. In the Cinco de Mayo episode, Hector reveals that despite Le Poodle disarming Teamo that he still has his skateboard screwdriver. He uses it to undo the bolts of their cage. Brenda while rehearsing with "Tiffany" for a song realizes that singing high notes shorts the latter out; it takes her much longer to realize that Tiffany is a robot. Rope Girl then exploits this to defeat the army of Tiffany bots at the end. Christmas Episode: "Happy Holidays, Mr. Gruff"
Clark Kenting: Crandall's mom seemingly can't tell why she never sees her son and "that kid from Teamo Supremo" in the same place; however, in the last episode, we find out that she's been aware of it the whole time. Cephalothorax: Technor without his Humongous Mecha. Clear My Name: In Cheapskate's episode, when Skate Lad is accused of stealing people's possessions, he's not allowed to do any more superhero stuff until the team can find out who the real culprit is. All the girls in the city whenever Tiffany Javelins is doing a public appearance immediately follow her lead, even Paulson's coworker Samantha and the Chief's daughter. Teamo's second episode involved How Do I Shot Web? with their upgraded weapons. When Le Poodle steals them in the Cinco de Mayo, he can't get Rope Girl's jumprope to work. While up in the attic in one episode, Crandall finds what appears to be an old costume of his with a "C" emblem on it. A few episodes later, we see that "C" emblem again on a microchip of the Cloaked Skull's mask, with Crandall remarking that it looks familiar to him somehow. Cool Big Sis: Jean to Crandall. She often provides useful information and advice to the team for their situations, serves as a Secret Keeper, and has huge career plans. Crowd Chant: The episode "The Big Put Down" has a villain called the Put Down Artist insulting everyone. They end up destroying his morale by chanting "Poco loco en el coco" at him (see Gratuitous Spanish below for an explanation). Curb-Stomp Battle: Technor in his first appearance defeats Teamo without breaking a sweat because they're still using an ordinary yo-yo, jump rope, and skateboard. Governor Kevin and Paulson anticipate this, so they immediately upgrade the team's weapons. Da Chief: The Chief, of course. Disappeared Dad: Averted; the kids' respective fathers make a brief appearance in "Grounded!" Disney Death: The last episode has the villain throwing a statue on Teamo and seemingly crushing them, but Crandall's super-strength suddenly appears and he lifts the statue up. Do Not Call Me "Paul": "Big Skull" does not like being addressed by that name. Eagleland: Flavor 1 definitely forms a part of the show's theme — highlighted when the show featured a villain based on the Red Scare. Early Installment Weirdness: An early episode has a different girl who gives Mrs. Woolingantz a note to excuse Teamo. 11th-Hour Superpower: Y'know those alleged superpowers Crandall claims to have? They manifest in the final episode (well, Super Strength at least) to save him from being crushed to death. El Spanish "-o": The series title is a mild case of this. Everyone Calls Him "Barkeep": The alien responsible for the Cloaked Skull's name is a repeated sound of chattering teeth. Since "saying" his name hurts your teeth, most Earthlings call him "Big Skull". Evil Diva: Tiffany Javelins, the Sinister Songstress, in her first appearance. Later on, due to her manager and Dr. Droid locking her up, she undergoes a HeelFace Turn and helps Teamo. Evil Minions: Most of the villains have them. Evil Twin: Dr. 'Droid makes robot copies of everyone, including Teamo and even himself. Skate Lad seems to have his own Reverse-Flash in the evil, super-speedy roller skater Cheapskate. There's also the evil, scooter-riding rival of Skate Lad, Scooter Lad. Explosive Overclocking: The one weakness of the Mega Gauntlets is a failsafe that shuts them down if they exert too much power for too long. Eyes Always Shut: Mrs. Woolingantz. Gentleman Thief: Le Poodle, whose name is a play on the Classy Cat-Burglar trope. The fact that in Tiffany Javelins's episode her manager is starting a campaign to encourage Tiffany's fans to Bare Your Midriff and pierce their belly buttons, as well as skip school and steal chocolate milk. Also note that a good portion of her fans are preteens, including Brenda, though the Chief's daughter and Paulsen's work partner also get swept away. Gone Horribly Right: Paulson's biggest mistake was when he invented the Mega Gauntlets and they proved to be too powerful to use responsibly. Gratuitous Spanish: Skate Lad breaks out in Spanish whenever he's angry, like when Le Poodle steals artifacts from a Mexican museum on Cinco de Mayo. In "The Big Put Down", Skate Lad refers to the Put Down Artist as "poco loco en el coco" (which, as Brenda explains, means "a little crazy in the coconut"). It ends up being helpful later on. The Catch Phrases of the respective team members also bring Spanish to mind, though they're gibberish for the most part. HeelFace Turn: Tiffany Javelins, alias the Songstress, helps Teamo after her first appearance. It helps that her manager and Dr. Droid locked her up when they made a bunch of robots based on her and decided You Have Outlived Your Usefulness. Halloween Episode: "The Haunted House on Horror Hill". Hoist by His Own Petard: Dr. Droid's plan to replace everyone in the city with robot duplicates backfires when his own robots turn on him and create a robot duplicate of Dr. Droid. Hook Hand: Laser Pirate has one that doubles as a laser blade. How Do I Shot Web? : When Teamo's weapons get upgraded from simple toys to serious gadgets, they have a tough time adjusting to them in the fight with Technor. They have to take the time to practice with them while Technor steals power from everywhere. Human Alien: Crandall thinks he's one. And if his sudden manifestation of super strength in the last episode is any indication, he may be right. Used on the Teamo and others in "Appetite for... Dessert", where the Teamo is hypnotized into wanting to eat junk food. Used on the Chief in "The Chief of Cheer"; Hypnotheria tells him to "destroy" Governor Kevin. Idiot Plot: When Crandall turns into his superhero-persona, the only thing he changes is his clothes. He doesn't even wear a mask, and has his real name right in his superhero name, which is basically just giving away his secret identity. Yet SOMEHOW, his own mother can't recognize him when he's wearing the costume. Incredible Shrinking Man: The plot of "Micro Supremo". Intrepid Reporter: Ollie Jimson, a Jimmy Olsen Expy. The Put Down Artist exists to make everyone else feel bad. Teamo explicitly mentions that they can't Beat Them at Their Own Game because they don't know how to stoop to that level. Eventually their retorts are more general like "poco loco en el coco" and reciting jokes that Mauricio wrote for them. Mauricio went too far by mocking Coco Caliente for her bad haircut on live television, when it wasn't her fault. In revenge she becomes The Stylist and vows to give everyone, including him, a Traumatic Haircut. Kid Hero: Our protagonists are all grade schoolers. Knows the Ropes: Rope Girl uses her jump rope several ways, among which like a whip and like a lasso. Large Ham: Crandall, who is convinced that he is an alien superhero. Legacy Character: Crandall's grandfathers were both superheroes. Specifically, expies of Batman and Captain America. Their advice doesn't help Crandall or Teamo when fighting his grandparents' old nemeses, but the two make a surprise appearance to corner the ringleader. Loophole Abuse: If Mr. Large ever gets arrested, odds are he'll always avoid jailtime because of some unnamed technicality. Mass "Oh, Crap! ": The heroes that would have auditioned to protect the city in the pilot run out of the governor's mansion screaming when Crandall screams "Baron Blitz is here and he's got a giant robot!" MayDecember Romance: In the last episode, Paulson has something he wants to admit to Samantha, but he gets cut off. And keep in mind, he's already got grey hair while Samantha looks below 40. Meaningful Name: It may not be a good idea to insult someone whose last name is "Caliente," the Spanish word for "hot". Coco Caliente takes offense when Mauricio makes fun of her bad haircut on live television. Meganekko: Crandall's mom, Mrs. Woolingantz, and the blonde girl who whispers to Mrs. Woolingantz to excuse Teamo. Misplaced Retribution: Mauricio was the only one who insulted Coco Caliente for her bad haircut, while the audience laughed. So obviously she must take revenge on the entire city and give them one Traumatic Haircut after another. Monster Clown: The Birthday Bandit, whose modus operandi is sabotaging birthday parties and throwing some sinister parties of his own. In one episode, he becomes the Valentine Bandit and sets out to ruin Valentine's Day. He's even voiced by someone known for a certain other evil clown. Motor Mouth: Dehydro. At times, his lines sound like they were written by Mojo Jojo. Mr. Exposition: The usual role of Governor Kevin and the Chief. Tiffany Javelins is an Expy of Britney Spears. Mr. Gruff in the Christmas Episode is a white version of Mr. T.
No Name Given: Crandall and Brenda's surnames have never been revealed. Brenda and Hector at first when Crandall tells them they're auditioning as heroes in front of the governor. Mauricio in the Stylist episode when she hijacks his show and gives him a Traumatic Haircut. His reason? He caused her Start of Darkness by making fun of the one time she came on the show with a terrible hairdo. One astronomer when Mirror Star steals the lenses from his telescopes. Patriotic Fervor: Skate Lad. Coming from a Mexican-American boy, strangely enough. Pirate: Laser Pirate, who ironically hates water. A Pirate 400 Years Too Late: Laser Pirate has advanced technology, but he's still an example of the classic "Arr!" pirate stereotype. Power Trio: It stars three Kid Heroes. Prim and Proper Bun: Mrs. Woolingantz hairstyle. Reasonable Authority Figure: The Governor at first is understandably nervous about three kids deciding to stop Baron von Blitz. When he sees them in action, however, and especially after they capture the Baron in the pilot, he makes them deputized heroes. He also prepares for when their ordinary belt, rope and skateboard will fail in battle and gives them upgrades courtesy of Paulson. Royal "We": Hypnotheria wants to become queen, and always refers to herself as "we". She mentions this trope by name in her debut episode, "Appetite For... Dessert!" Rope Girl: We sleep right, train hard, and always make healthy food choices! Hypnotheria: Healthy food choices, eh? Well, we'll see if we can't fix that! Hypnotheria: We are, you pathetic peasant! I'm using the royal "we". Running Gag: Jean always wants a different career each episode. "Scooby-Doo" Hoax: In fact, the episode itself was a Scooby-Doo parody entirely! Governor Kevin knows who all the kids are, and in fact usually calls them from their class. In the first and second episode he called their home line, before they got upgraded to phone watches. Jean and Mrs. Woolingantz (since "The Sinister Substitute"). Not only does Crandall's mom know their secret, but she also seems to be hiding something about Crandall. Shouldn't We Be in School Right Now? : Discussed and lampshaded by the Chief in the pilot. Later on, Governor Kevin calls the kids' school so they can be excused from class. Shout-Out: While under mind control in one episode, the Chief exits with a "B"-gesture by his nose and says "Be seeing you!" While trying to look for help from Captain Excellent's hideout, one of the devices they find is a machine that goes "PING!" Skate Lad's costume resembles that of Evel Knievel. An episode features Mr. Beryllium, the editor of the Stately Planet newspaper, and his cub reporter Ollie Jimson. Mr. Beryllium keeps telling Ollie to "call him chief." One of the Birthday Bandit's henchmen is a woman in a harlequin costume. The villainous Inflato resembles Jackie Gleason, and even uses several of Gleason's comedic mannerisms ("hard-de-har-har!," "one of these days..."). His henchmen are parodies of Dean Martin, Jerry Lewis, and Sammy Davis, Jr.
Sky Pirate: Laser Pirate's gimmick. Speech Impediment: Captain Crandall has a slight lisp. Sssssnaketalk: The reptilian Madam Snake's speech impediment. Stern Teacher: Mrs. Woolingantz always excuses Teamo from class, but does not like it when their homework is left unfinished. Stock Footage: Teamo's transformation sequence is always the same (except in the wintertime episodes when they're dressed appropriately). Also, a sequence of Teamo traveling past a crowd of surprised citizens is often recycled throughout the show's run. Take Over the World: Baron Blitz aims to do this in his last appearance (OF COURSE!!). Team Pet: Crandall's dog, Action. In the pilot it's revealed that Crandall has turned his doghouse into a secret hideout. Thememobile: In the first episode, Paulson is about to unveil a car that Teamo could supposedly use. But since Teamo's members are too young to drive, this becomes a subversion. They Fight Crime! : Gimmicky villains, to be specific. The Chief during a Green-Eyed Monster phase learns that Teamo can do many things, but they can't control traffic. This is something he can do, however, with pleasure. Also, the Chief has to coach Teamo when Baron von Blitz possess bronze statues from the Football Hall of Fame and Teamo's usual techniques don't work well on the field. ¡Three Amigos! : The eponymous trio. Time Travel: Lord Druid plans to go back in time, stop the nation from becoming a democracy, and establish himself as the monarch. Totally Radical: Governor Kevin lived this trope, but it was probably intentional and he managed to come across as a pretty cool guy despite (and perhaps even thanks to) it. Traumatic Haircut: The Stylist delivers this to anyone who encounters her, including Teamo, thanks to a haircutting robot. She reveals her evil plan is to publicly humiliate her victims by putting them on live TV for the world to see. Eventually Skate Lad defeats it by trapping it under a hair dryer. Voluntary Shapeshifter: Madam Snake's M.O. She used her talent to disguise herself as those close to Temo Supremo to undermine their efforts, like when she disguised herself as their teacher and kept them buried under ludicrous ammounts of homework. Wake Up, Go to School, Save the World: They're heroes, but also grade schoolers. "Walk on the Wild Side" Episode: Brenda twice, in both of the episodes with Tiffany Javelins. By emulating Tiffany, who is ordered by her manager to be a "bad girl," Brenda skips school, pierces her belly button, steals chocolate milk, and uses her rope against Hector and Crandall. In the second episode she signs a contract to become a star like Tiffany, only to go back on it. Rope Girl gets suckered into entering a music contract with Tiffany Javelins in the latter's episode because the manager plays on her wanting to be a Star. Brenda rips up her contract when she learns that the Tiffany she performed with was a robot and she abandoned her friends when they needed her help. Well-Intentioned Extremist: In his first appearance Dr. Droid wants to make the world a better place by replacing "imperfect, unpredictable" humans with robot duplicates. Unfortunately, because he is an imperfect human, the robots turn on him to make the world better. Before their knockout gas affects him, he manages to tell Captain Crandall how to wake everyone up from their drugged sleep. Where the Hell Is Springfield? : The state's name is never mentioned. Why Did It Have to Be Snakes? : One episode established that Brenda is deeply afraid of water, to the point of being afraid to take a bath (she says she takes sponge baths instead). She manages to overcome this fear by the end of the episode. Would Hurt a Child: Madam Snake definitely would, as shown when her henchmen sprain Skate Lad's leg and give Rope Girl a lot of splinters in one episode. Wouldn't Hurt a Child: For what little it's worth, most of the villains in the show fall under this. Le Poodle incapacites them in the Cinco de Mayo episode, for example, but just locks them up to be sent away and confiscates their weapons. You Gotta Have Blue Hair: Brenda's hair is purple. Youthful Freckles: Crandall has these. Zerg Rush: Le Poodle's henchmen overwhelm Teamo Supremo in this fashion during the Cinco de Mayo episode. They surround Rope Girl so she can't catch them all, get into tug-of-war over Skate Lad's board, and pickpocket Captain Crandall's utility belt.